The Dr. Seuss Mystery Minis include your favorite characters! Each figure measures approximately 2 1/2-inches tall. Series 1 display case contains 12 individually packaged blind-boxed mini-figures. "A person's a person, no matter how small." And a toy is a toy no matter how mini! From the inventive minds of Dr. Seuss and Funko, come the Dr. Seuss Mystery Minis! Favorite characters like Horton, The Lorax, Fox in Socks, The Grinch, Sam I Am, and more make up this delightful assortment of 2 1/2-inch tall blind-boxed figures - which ones will you get? 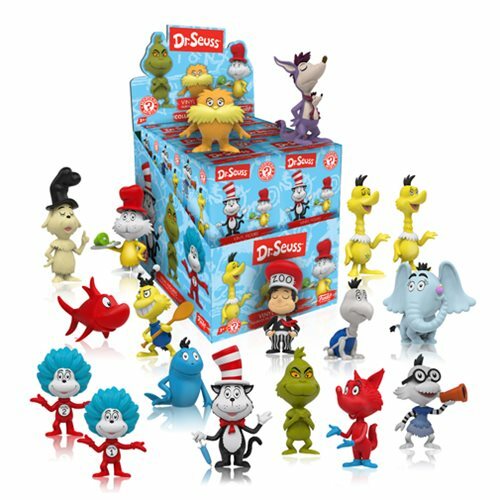 The Dr. Seuss Mystery Minis Series 1 Display Case contains 12 individually packaged blind-boxed mini-figures.